In upcoming days a symbolic operation will take place at London Staidum. Before the Saturday (April 20) game against Leicester fans will be welcomed by a new claret carpet covering the running track and direct perimeter of the playing field. It will replace the light green surface installed initially at the stadium. All of the cost will be borne by West Ham United, who expect to spend £250,000 ($326,000) on the operation. Installation work hasn't begun yet, it's expected to take a few days of the upcoming week. Rendering of how the new surface would look. While it seems like a minor change, it took a major conflict to get to this point. Initially the public managing company (LLDC) had refused. The intention was to keep this exposed space neutral and eventually make it part of a greater sponsorship deal, possibly with the still-to-be-found naming rights partner. 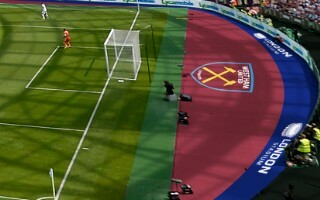 Long-lasting argument between West Ham and LLDC was finally settled late last year, when both sides agreed to change the synthetic surface. Along with adding names of WHU legends to parts of the stadium, it's expected to improve its perception within the fanbase.